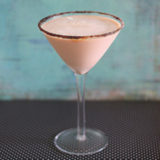 Whipped cream vodka, Kahlua, and half and half shaken until ice cold and poured into an instant-coffee-and-sugar-rimmed martini glass. 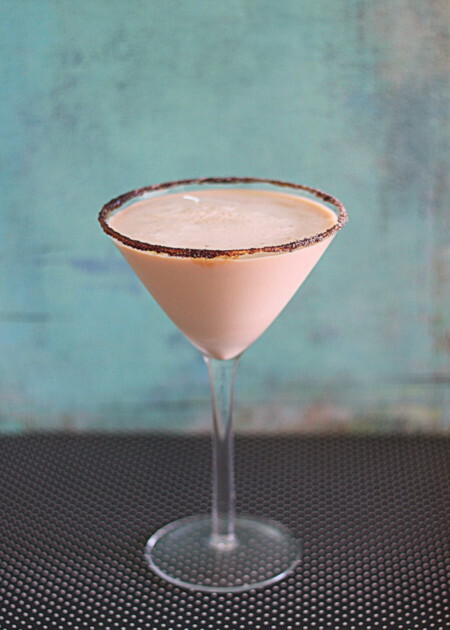 It's just as rich and creamy as its tamer, non-alcoholic namesake, just with less caffeine. And, you know, alcohol. It’s official, I guess … I am on even more of an iced coffee kick than usual. 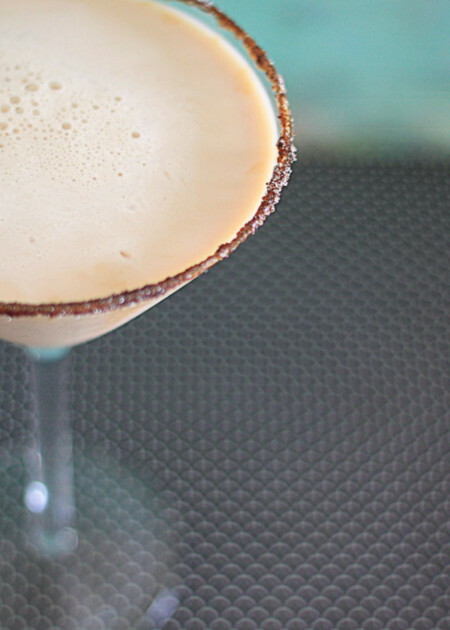 This time I’ve whipped up a beverage that’s more for the PM than the AM: an iced-coffee-inspired martini. It’s just as rich and creamy as its tamer, non-alcoholic namesake, just with less caffeine. And, you know, alcohol. How did this drink come about? Well, I’ll tell you. As of June 1 here in Washington State, liquor is officially available in grocery stores. No longer do we have to shop in dedicated, state-run liquor stores, feeling ever-so-slightly deviant as we duck in and duck out with our paper-bag-encased bottles. Now we can shop for our favorite libation at our neighborhood Safeway, if we like, our bottles tucked in alongside strawberries and French bread. This is way, way cooler than it ought to be. So naturally, I had to buy a bottle of something on my first visit to a liquor-stocked grocery store. And so I came home with a bottle of Pinnacle Whipped Cream vodka, something I’d been wanting to try for awhile. And, because I am obsessed with iced coffee, I mixed some with Kahlua, added a nice heavy dose of half and half, and dipped the rim of the glass in a little Starbucks Via instant coffee for good measure. And there you have it. Iced Coffeetini, thanks to Washington State voters and iced coffee’s wonderfulness. It’s terrific, and like most drinks, great for a mixed-diet household like ours. After all, everyone loves a good cocktail. Fill one saucer with a little water. Shake about half the packet of instant iced coffee into the other saucer. 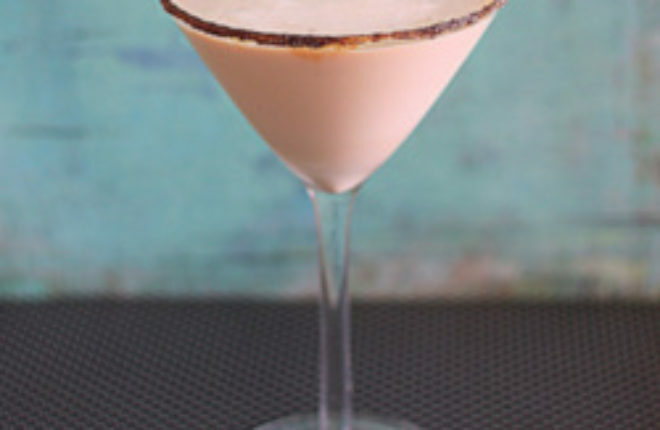 Carefully dip the rim of the martini glass, just barely, into the water, then dip and twist the rim in the saucer with the instant coffee until covered. Place glass right side up. Add whipped cream vodka, Kahlua, and half and half in a cocktail shaker. Fill with ice and top with the lid. Shake for about 20 seconds, then strain into the martini glass. Serve. You can use any instant coffee for the rim in lieu of the Starbucks Via instant iced coffee. Just mix one teaspoon instant coffee and one teaspoon fine sugar.